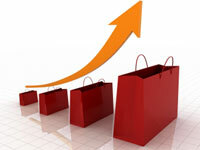 Home Popular Cross-Sells and Upsells: What is the Diff? The terms cross-sell and upsell are often used interchangeably because, let’s face it, this gets confusing. Say the customer is viewing a 4GB iPod Nano for $169. Portable DVD player, $299 -> Cross-sell. Cool gadget, customer “may also like” but not related to mp3 player. The label “Go Deluxe” suggests an upsell. 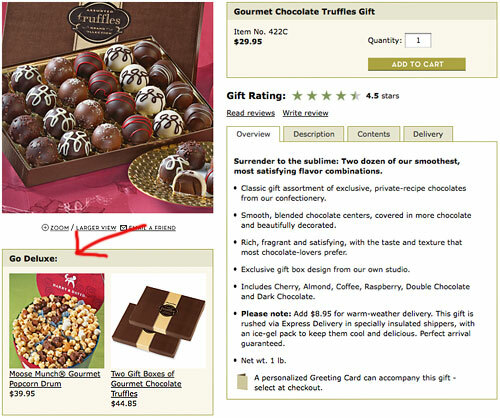 One suggestion is to double up on the chocolate truffles and get 2 for $44.85, a true upsell. The other takes a product from another category (that is of higher $ value) which would be considered a cross-sell if suggested in addition to, rather than instead of the product being viewed. In this case, the popcorn is an alternative product suggestion rather than a true upsell of the truffles. Aside from label clarity, another benefit of separating your suggestions into separate merchandising zones is more accurate tracking of what types of suggestions are more effective. Are you more successful persuading customers to add to their order or upgrade to a more expensive model? So while we don’t need to get too hung up on what cross-sell is vs upsell (there’s room for a bit of crossover in definition), and we should add the third category of “alternative products,” understanding the general differences can help us make better decisions in selecting product associations, labeling merchandising zones and measuring the conversion of different suggestions.